Rodeo entry form is NOT valid until the State 4-H Office has a completed, signed 4-H Rodeo Eligibility Certificate and Waiver of Liability form on file for each contestant. Please contact your County Extension Office for more information. Where: State 4-H Office, Neale Hall, NMSU campus or Zoom Video Conference on the computer. *Assumption of Risk Form needs to be in the State 4-H Office 15 days prior to your first participating rodeo. 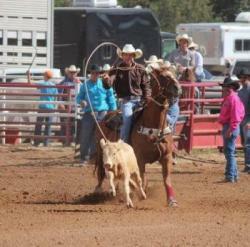 The deadline for each county rodeo is indicated below. Please Contact your county office for details to ensure you do not miss this deadline. Deadline for Rodeo Rule Change Request forms has been extended to January 31, 2018. To make form fillable, download a copy of the form to your computer.